Why use hose reels? Because they make hose handling more efficient and safer. Your hoses, cables and cords will last up to five times longer! The chances of injuries from tripping hazards will decrease, which saves on medical bills and lost work time. You also save on the effort, cost and time to replace expensive hoses, cables and cords that get run over by fork lifts and other vehicles. Reelcraft is your choice when it comes to hose reels! A reputable name in the industry, Reelcraft is well known for designing durable and high quality products. The standard features include corrosion-resistant powder coat paint, multi-position guide arms for versatile mounting options, and heavy-duty, reinforced steel stampings for increased strength. Let us help you manage your hoses better! 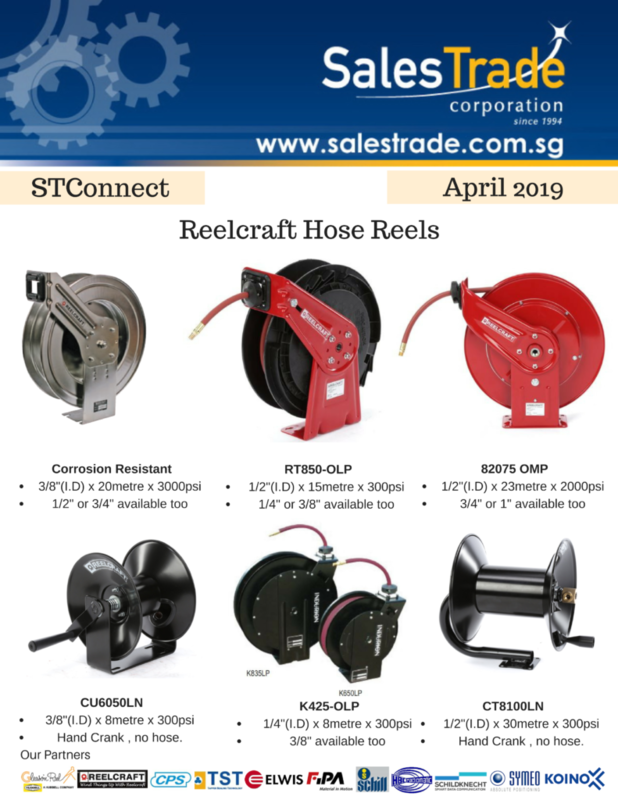 Contact us at sales@salestrade.com.sg for more information or click here to view a selection of reels. Copyright © 2019 Salestrade Corporation (S) Pte Ltd. All Right Reserved.